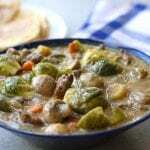 A hearty winter meal that is high in fiber, gluten-free and has a low glycemic index. Cut roast into 1/2 inch squares and generously salt. Heat a large frying pan over medium/high heat for about 4 mins. Add oil, place cubed meat in a single layer and leave alone for 4-5 mins or until meat easily pulls away from sides & bottom. Remove seared meat from pan and into stockpot. Dispose of excess grease and then deglaze frying pan with wine, add to stockpot. Add onion, carrot, celery, garlic, herbs, Worcestershire sauce and broth to stockpot. Stir well and bring to a boil. Once boiling lower down to a simmer. Simmer for approximately 1 hour or until meat and vegetable are tender making sure to stir occasionally. Measure chickpea flour into a small mixing bowl and make a slurry by adding a few tbsp at at time of water or broth until a paste is formed minus lumps. Slowly drizzle slurry into pot while stirring stew. Keep at a simmer and add brussels sprouts and mushrooms. Continue simmering, stirring often, for another 20-30 mins or until sprouts and mushrooms are cooked to desired doneness.